1. Get knowledge in the area in which you want the ideas. 3. Choose the best ideas from the results. You wouldn’t expect to come up with a new theory of relativity if you had no knowledge in physics or mathematics. You need some degree of knowledge in the area in which you want new ideas. For truly great ideas, it helps to have a great deal of knowledge. To create a new transportation device, for example, you would want general knowledge in that field, as well as more specific knowledge. This might include knowing a little about all the current modes of transportation. You might add to that a list of things that have been tried and failed, and a list of all the things that people want in their transportation. Ideas and inventions start in the mind, and the mind follows certain patterns and rules. This is why tools such as problem solving techniques and other idea generating techniques work so well. Consider the “concept combination” technique, for example. Tell your mind that you need a useful combination of a plane and a motorcycle, and it will search until it finds it. This mind took twenty seconds to imagine wings that expand out at high speed from a motorcycle, allowing it to glide right off the edge of a cliff. The technique of redefining problems in many ways can open whole new areas to explore. Redefining “inexpensive homes” as “ways to help people afford homes” has lead to all sorts of new financing methods that have made it easier to buy a home even as prices have risen. If “better job” becomes “better way to make money” you open a whole range of possibilities. There are dozens of great idea generating techniques to choose from, each with it’s own advantage. 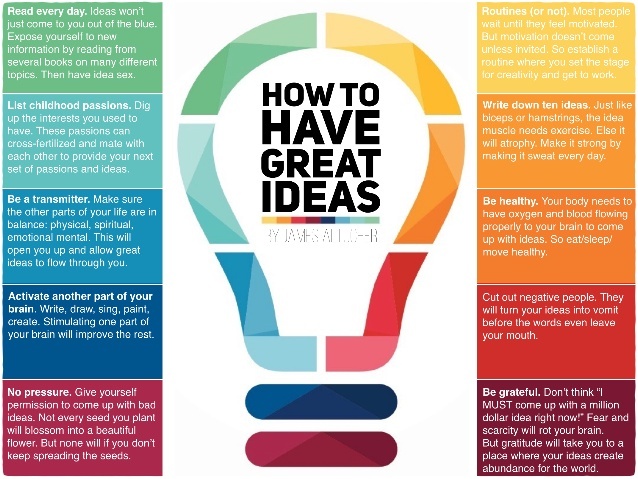 The more ideas you come up with, the more likely you are to find good ones to work with. This is why you should learn the systematic ways to produce new concepts. Finally, if “great” means “important” to you, you need to work in important areas. There’s nothing wrong with inventing a better clothes hanger, but if you want to change the world, start working on new ways to save the environment, ways to end hunger, new political processes that avert wars and other great ideas.